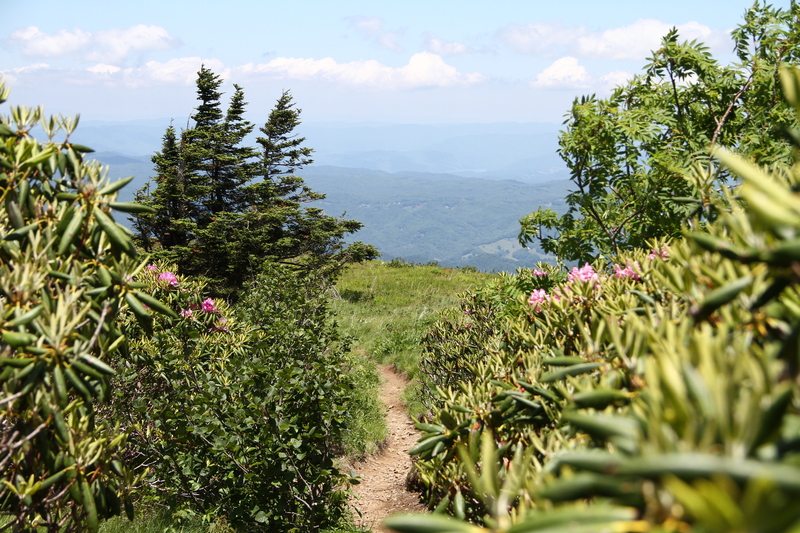 Rhodos in Bloom on Roan Highlands! 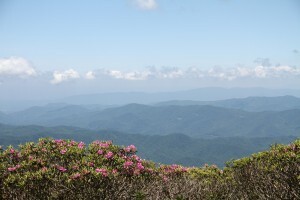 Come mid to late June of every year 600 acres of Rhododendron bloom on Roan Highlands, TN, about 13 miles down Tennessee Highway 143 from Roan Mountain State Park and a 3 hour drive from Charlotte NC. 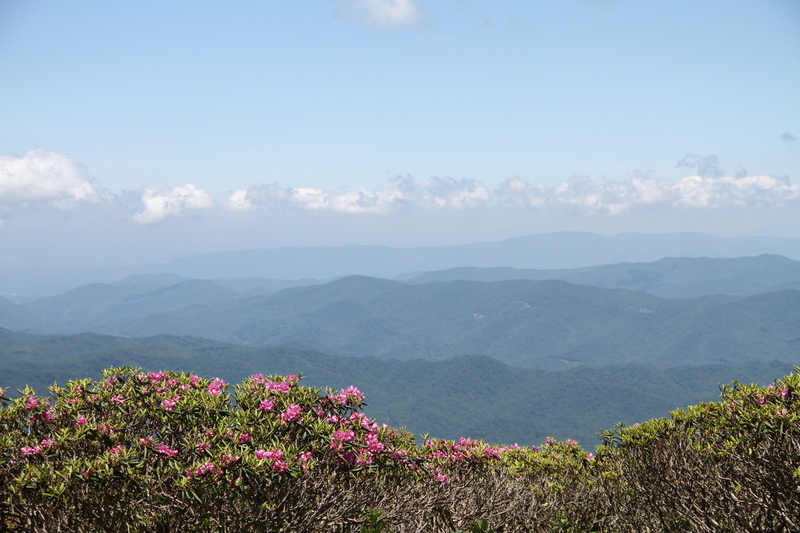 Our trip took place the week before Roan Mountain TN’s famous Rhododendron Festival. Not to be outdone, the Azaleas were electric adding splashes of orange and yellow! As one of our fellow hikers stated, there are multiple “‘Sound of Music’ Moments” on these mountain balds. 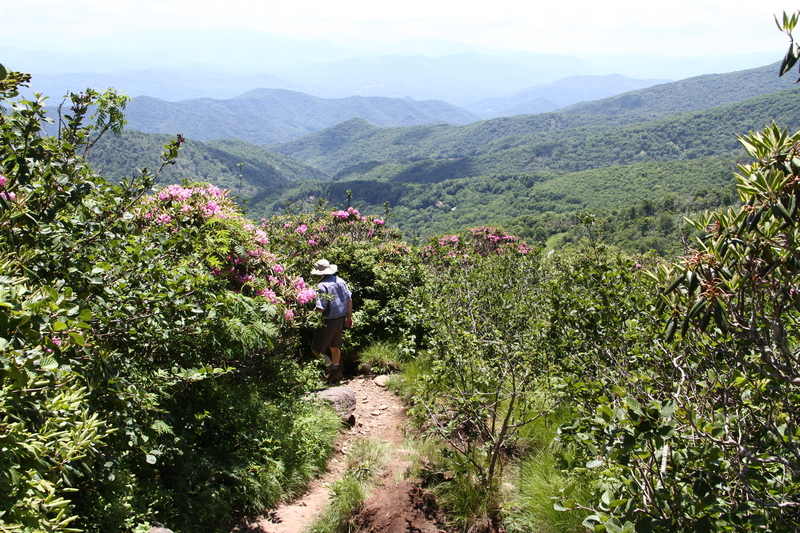 Hosting the world’s largest Rhododendron garden & the longest stretch of grassy mountain bald in the Appalachian Mountain Range, Roan Highlands encompasses Roan Mountain as well as Yellow Mountain & Hump Mountain. The area is rich in history as the Overmountain Men crossed over the Highlands on their way to the Battle of King’s Mountain in the American Revolutionary War. 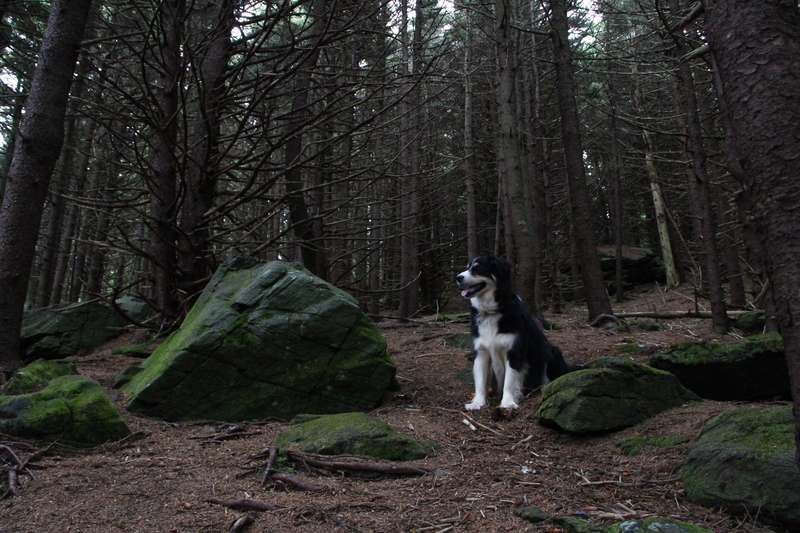 The area was heavily logged in the late 1800s, resulting in massive erosion and floods in the early 1900s. In the mid-1800s, the Cloudland Hotel on Roan Mountain was quite the tourism hotspot and many people came to get away from the big cities and to take in the fresh mountain air. The Appalachian Trail also traverses the Highlands. 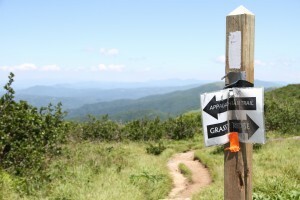 Roan Mountain is divided by Carver’s Gap into Eastern and Western sections. 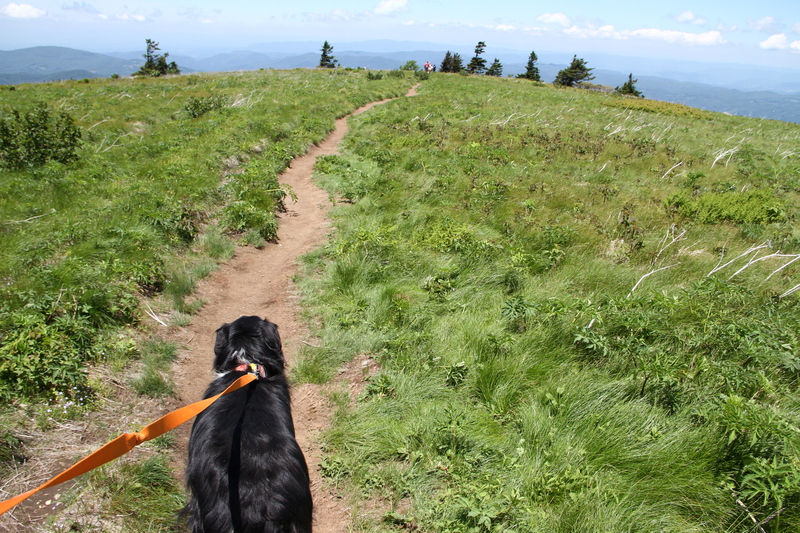 Our hike went East of Carver’s Gap over Grassy Ridge, which contains Round Bald, Jane Bald and Grassy Ridge Bald. 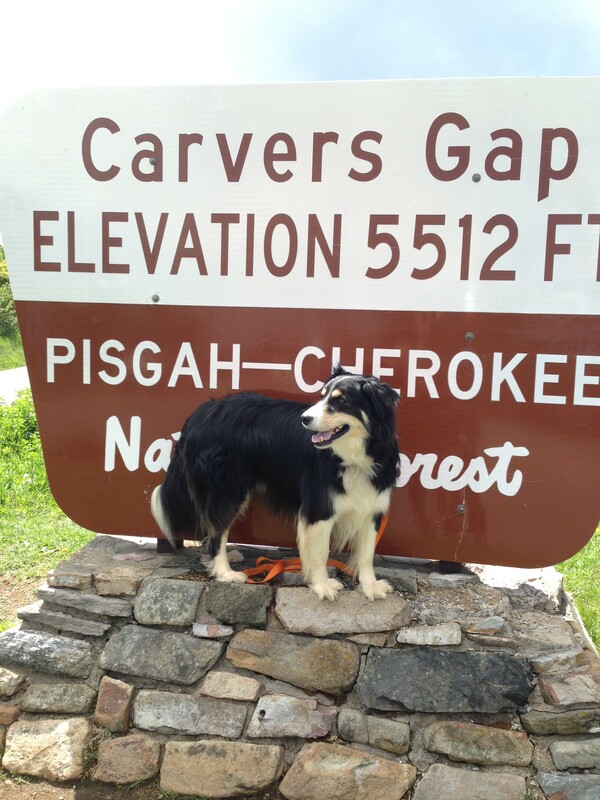 Our trailhead was located right across from the Carver’s Gap Parking Lot by the roadside behind a split rail fence. The trail starts off with a gentle climb through a stand of trees planted in the 1940s but that are now slowly dying. 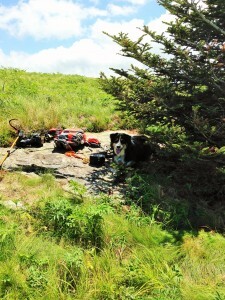 After a short climb uphill, the trees open up to a vast mountaintop meadow with 360 views! For all the shutterbugs out there, I will urge you to bring PLENTY of memory cards (or film) for your camera(s) as it’s hard to get more than a few feet without the Mountain presenting another photo op! 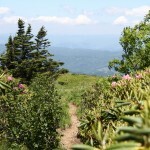 As another fellow hiker described them, the views from the bald are “hiking eye candy”. Whether it’s expansive mountain landscapes that go on for miles or close-ups of fields of flowers, this area has it all! 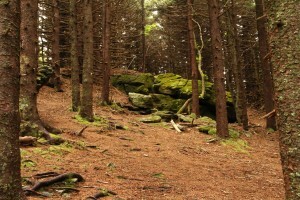 While some of the trail is a dirt path, other sections can be very rocky and rutted. If one were to assume that the journey across the bald would be a simple stroll, one would assume wrong. There are several areas of the trail where one has to traverse large flat rocks that can be slick as glass. The stacked rocks may be uneven and not provide the surest of footing. Thus, hiking boots are a must and I would strongly recommend a sturdy hiking stick, no matter how good you feel your balance is! 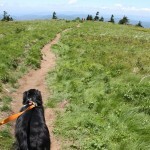 Our trip took us to the top of Grassy Ridge Bald. 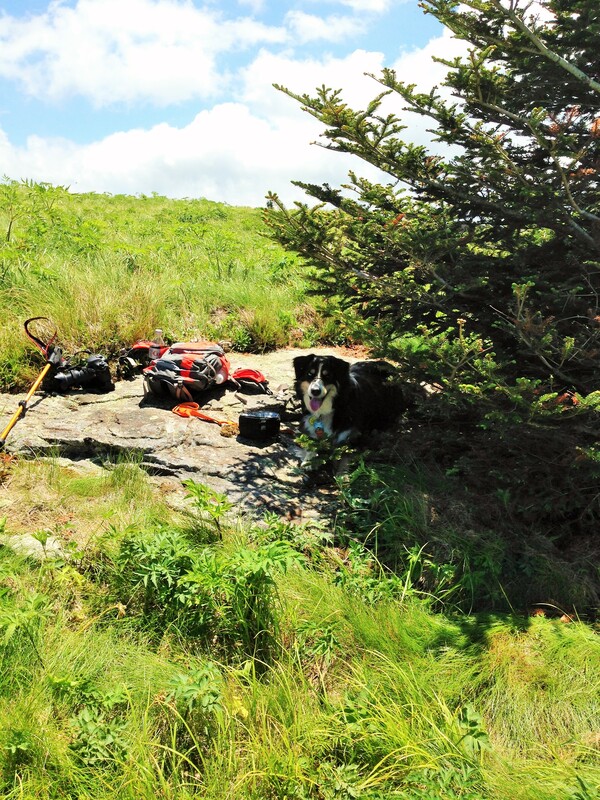 There was a significant amount of elevation loss and gain so be sure that you and your dog(s) are physically fit enough to handle this. Although the elevation here is about 6149′, keep in mind that there is minimal tree canopy on the bald and so you’ll be in direct sun a good part of the day. Sunscreen is a must! As one of our hiking party realized later, it’s also an excellent idea to wear a hat to block the sun from one’s scalp lest risk rocking a “sunburn Mohawk” down the small part in your hair. 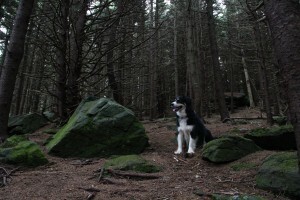 It’s also important to carry at least 2 liters of water/dog as well as hydration and a snack for oneself as it can get surprisingly hot on this mountain top in the Spring/Summer! 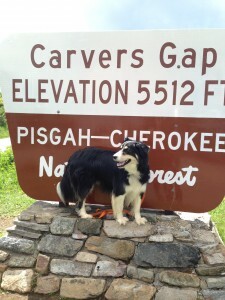 The parking lot at Carver’s Gap is usually overflowing by midday as we found MANY cars parked along the roadside. Arrive EARLY! 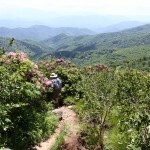 Allow plenty of time to do this hike as you’ll want to soak up every inch of scenery! Disclaimer: The information provided in this blog post is for informational purposes only. These travel blog posts are done as our way of helping people to see what all they can do with and where all they can take their dogs in the hopes that this leads to fewer dogs being relinquished to animal shelters & more being included as a part of the family. Neither the author nor Fabulous McGrady and Friends Foundation are responsible for any problems that occur should the reader chose to travel to any of the destinations covered in this blog. It is up to the reader to do their own research and prepare themselves/their pet(s) appropriately for a safe, enjoyable travel experience. Every effort has been made to insure the above information is as up-to-date as possible but things may change in the future so it is strongly recommended that the reader do their research before travel. 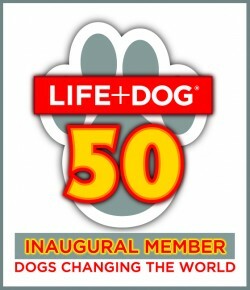 Reader should also check to insure that dogs are still allowed at a venue before travel.